Linda Bareham’s Portuguese Pork and a new abode! First of all, sorry that I haven’t posted in a long time. Three very important things have happened. I moved into my very own apartment for the first time since moving to Cambodia. After my holiday in the UK, I’ve been injected with a new dose of enthusiasm to embrace life in Cambodia with all it’s ingredients and flavours. I started a new job. I’m now an English Language Teacher at a Language School in Phnom Penh. The third point is very important. It goes a long way in explaining why I haven’t posted anything on the blog in recent months. I’m really enjoying the work but adjusting to a new job is taking up a lot of my energy. Even more so, as I’m teaching every evening during the week. But, excitingly it’s the first and second points that motivated me to make more use of local ingredients and cook this dish. Finally having my very own space for the first time in 10 months was so exciting. I even baked Orange and Cardamon shortbread to herald in this new space that I could call home (which I’ll post once I’ve perfected the recipe). Admittedly, I probably should have been putting my energy into packing boxes when I made them. My new kitchen comes equipped with a two burner gas cooker, typical of many Phnom Penh kitchens. So, recently, I’ve delved back into Linda Bareham’s One Pot cook book and discovered recipes that I can make easily here. I realise that I’ve written about the adjustment to sourcing various ingredients for baking or learning various processes because I can’t find the ingredients in the form that I want. Well, it’s been a similar thing for cooking with local ingredients here, or perhaps it’s been an even greater learning curve. I like cooking with local, seasonal produce. Back in the UK, I would quite often ask market stall holders how I could with new ingredients. But, to do that in a foreign language with unfamiliar ingredients is quite a challenge. It took me 6 months to brave buying fresh meat from the market. That may sound silly to you. However, imagine a market place, where there are various meat stalls. Some have live chickens, plucked chickens or various slabs of pork meat, hanging from meat hooks. Then, add the smell because, of course, it’s all unrefridgerated and unpackaged. Now, can you picture the flies lazily circling round before resting on one piece of meat and then moving onto another. I’m just not used to it, coming from the UK. So, I asked a lot of questions to khmers and seasoned expats before plucking up the courage to venture out on my first solo meat shopping trip. Here, the recommended wisdom is to go fairly early in the day, before 10.30-11am. Prod and smell the meat to know whether the meat is fresh or a day old. I’m still learning how you do that without insulting the seller. But then, there’s the added complication of language. How an earth do I say chicken breast in khmer? How do you ask for it without the bone? How do I make sure that I don’t get ripped off by a market seller out to make a lucrative deal from an unsuspecting foreigner. 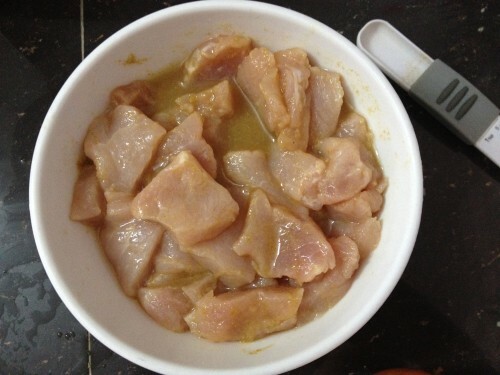 That first time when I bought fresh chicken breasts from the market, I spent an hour deboning the chicken breasts, when I got home. That didn’t stop me from celebrating it as a major achievement. 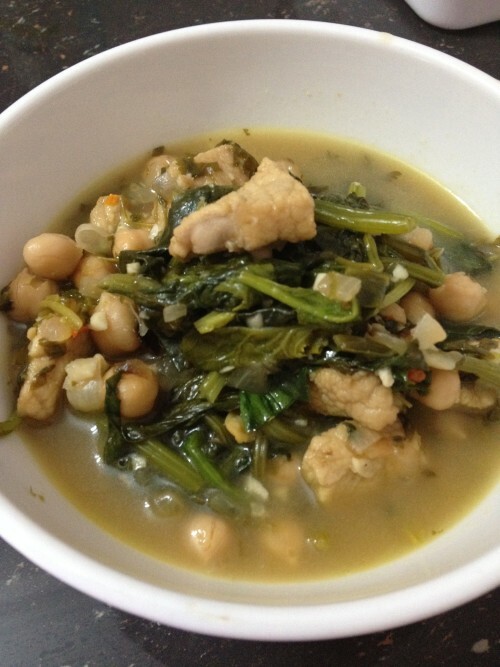 In fact, the first time I made this dish was the first time I’d ever bought pork from the market. I couldn’t tell you what cut of pork I ended up bringing home, but I think that it was pork fillet. I made it for my Simon and Becci when they had just moved house. We all declared the dish a success. 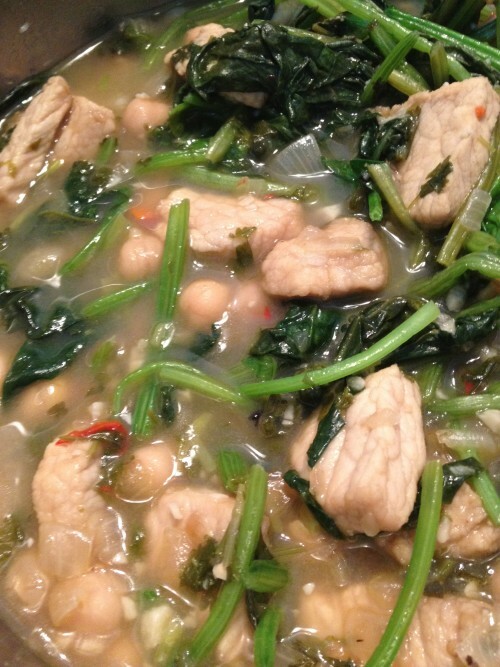 Then I made it again with the addition of spinach because I was craving more greens in my diet. This time, I served it to some of my khmer friends and they liked it too. Hurrah! I adapted the recipe slightly. I substituted limes for lemons and added a wee bit more heat by adding in more chilies. 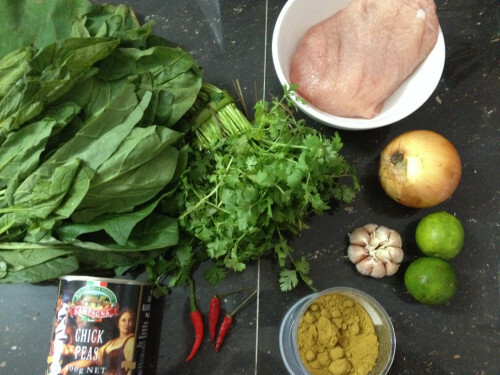 I try not to cook with MSG and the khmer ‘knorr’ chicken stock powder is full of it. So, I substituted sea salt for chicken stock, or make your own stock, if you want. Linda specifies red onions, but I can only buy shallots here. I’ve used shallots and white onions, depending on what I had in the fridge. I’ve specified how much garlic to use, if it’s a normal-strong garlic bulb. I find that the local khmer garlic is a much milder variety, so I’ve also taken to doubling the quantities of garlic specified in recipes. And apparently it helps to ward off the mosquitoes. Linda Bareham’s Portuguese Pork to serve 4 people, as adapted by me. 1. 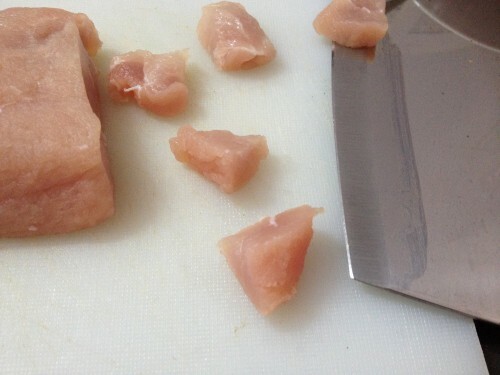 Chop the pork into 1 inch chunks and place them in a bowl. Add the cumin and the lime juice. Mix thoroughly. The lime juice will help soften the meat. Set aside in the fridge while you prepare the other ingredients. 2. Finely chop the onions. Add the oil and a wee bit of salt to a medium sized pot. Gently fry the onions for 10 minutes so that they’re softened with a little colour. 3. Meanwhile, finely chop the garlic. Slice the chillies fairly small chunks. I didn’t bother deseeding them because I wanted to add a bit of heat to the dish. Add them to the onions and cook for 4-5 minutes. Stirring occasionally and watching that they don’t burn. Add a bit more oil if needed. 4. Take the pork out of it’s lime bath and add it to the pot. Don’t throw away the lime/cumin juice! You’ll use it again in 5 minutes. Stir the pork so that it colours evenly. 5. Add the boiling water (or stock if you’re using), lime/cumin juice and chickpeas to the pot. Turn up the heat and bring it to a boil. Then turn down the heat and let it simmer. 6. Season with salt and pepper to taste. Linda assures you that there’s a lot of seasoning required. In the end, I found it easier to crush and finely chop some whole black peppercorns and add them in, rather than grind, twist, shake with a pepper mill. I agree with Linda. You’ll need a lot of pepper. 7. 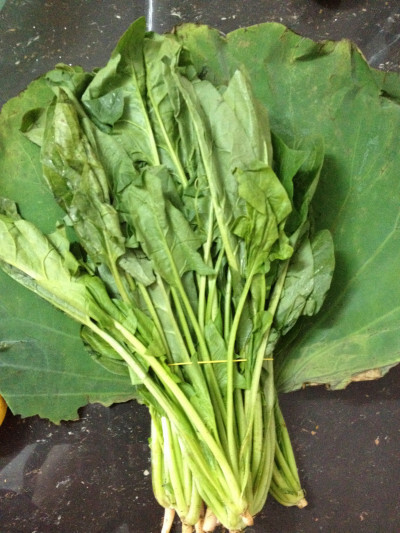 As I can’t buy a bag of spinach leaves easily, I chopped and discarded the bottom bit off my spinach stalks, gave them a thorough wash and added the spinach leaves and stalks to the pot. 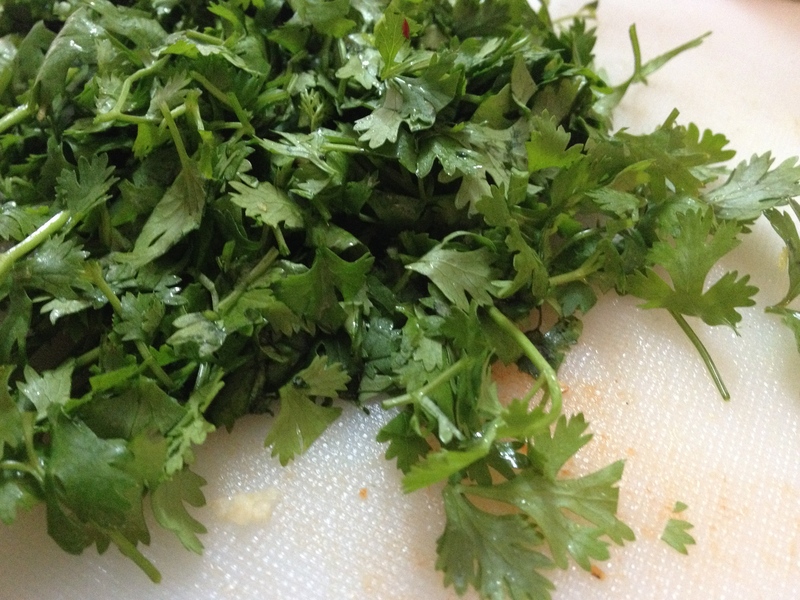 Finally, add roughly chopped coriander leaves and stalks. Et, voila. Serve with a wholesome crusty loaf or baguette.